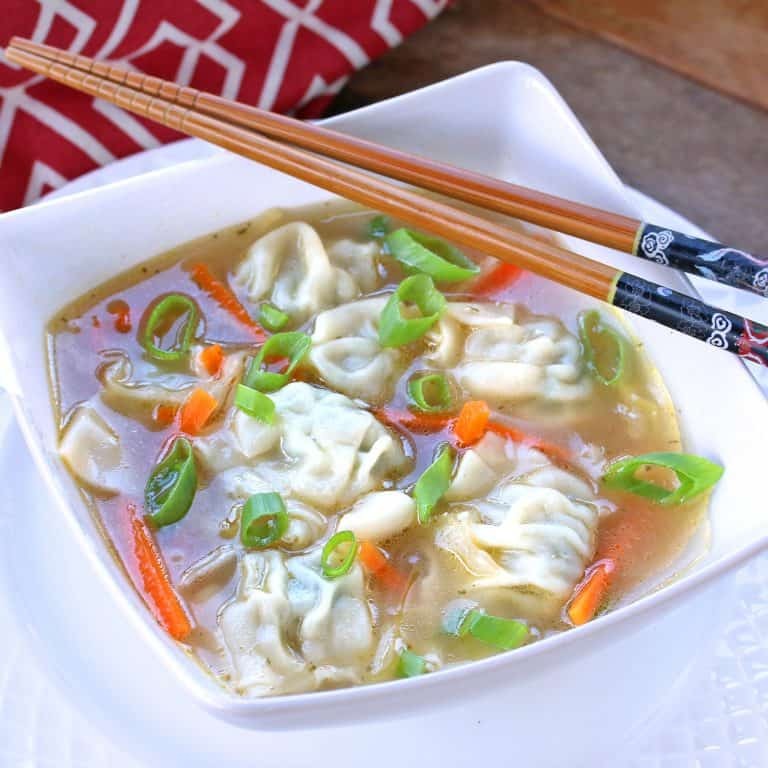 One of the most popular of all Chinese soups, with its rich and aromatic broth and its plump, flavor-packed wontons, this wonton soup is a guaranteed showstopper! Wonton Soup is like the chicken noodle soup of Chinese cooking. With its nourishing broth, vegetables and protein-filled pasta, it provides all the comfort needed to turn a gloomy day around. Best of all, it’s the kind of soup that you can enjoy all year round. Served in virtually every Chinese restaurant and continues to be one of the most popular of all Chinese soups. And I’ve generally found that a good way to gauge the quality of a restaurant is by its wonton soup. If the ingredients are fresh and flavorful, that’s almost always an accurate indication that the rest of the food will be good. 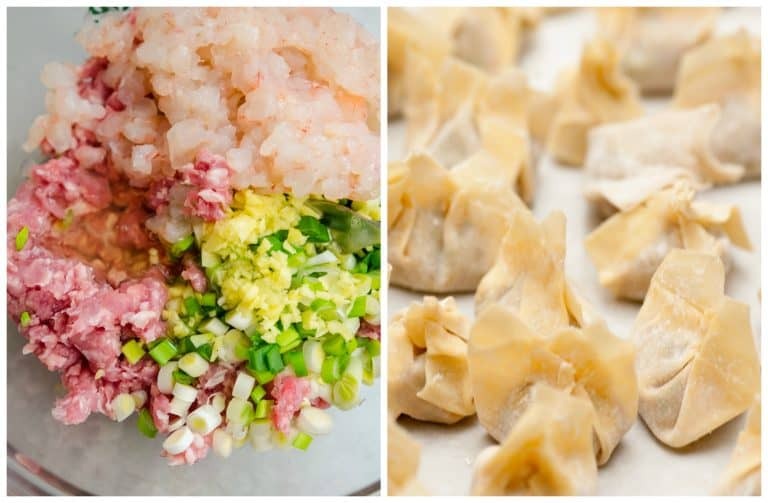 Wontons originated and have been enjoyed in northern China since ancient times. Known as hundun, which means “chaos” in Mandarin, they refer to the Chinese mythological character, Hundun, who represents central chaos in Chinese cosmogony. The process of chopping up and combining various ingredients to fill into wontons and then gathering up the edges of the wonton dough to seal them was evidently a little more chaotic than the typical cooking norms of ancient times. However in Cantonese the meaning translates to “cloud swallow”, reflective of the soft, silky pillows of pasta floating in the the broth and gliding seamlessly down your throat. But whether clouds or chaos, once thing is certain: Wontons are heaven and when they’re added to soup they’re simply irresistible! Each region of China features its own variation of wonton soup. Our wonton soup features something of a blend of these regional influences with both its filling, broth and seasonings. And we’re pretty confident you’re going to love it as much as we do. For convenience the wontons can be assembled and frozen so all you have to do is make the broth (super quick) and throw in the frozen wontons for a few minutes and you have a ready meal! For the best wonton soup you need quality broth. Not everyone has the time or the space to make and store homemade chicken stock on a regular basis. 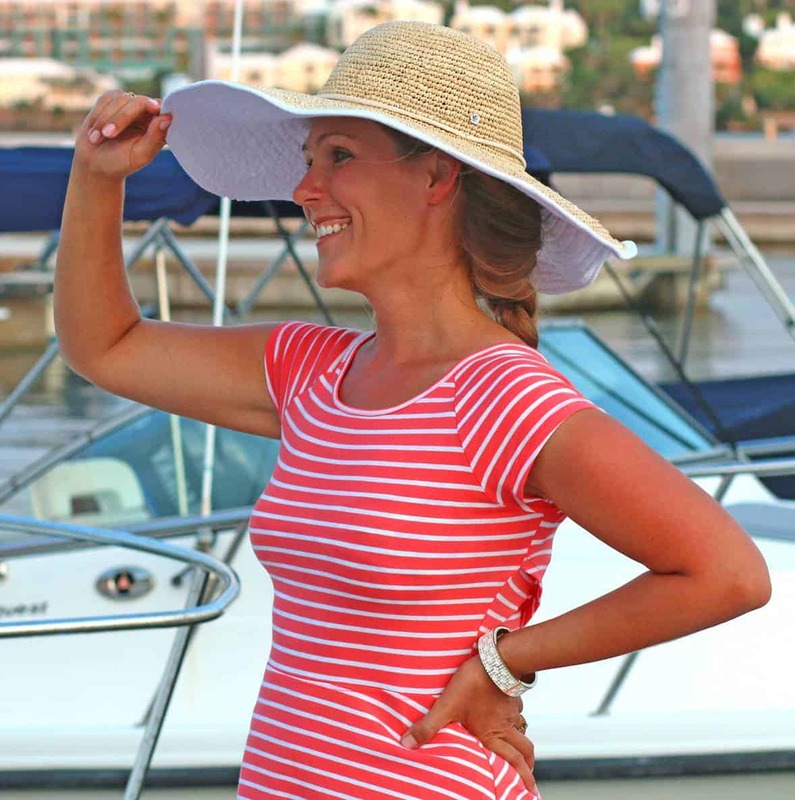 For store-bought brands we use and highly recommend the brand Aneto. 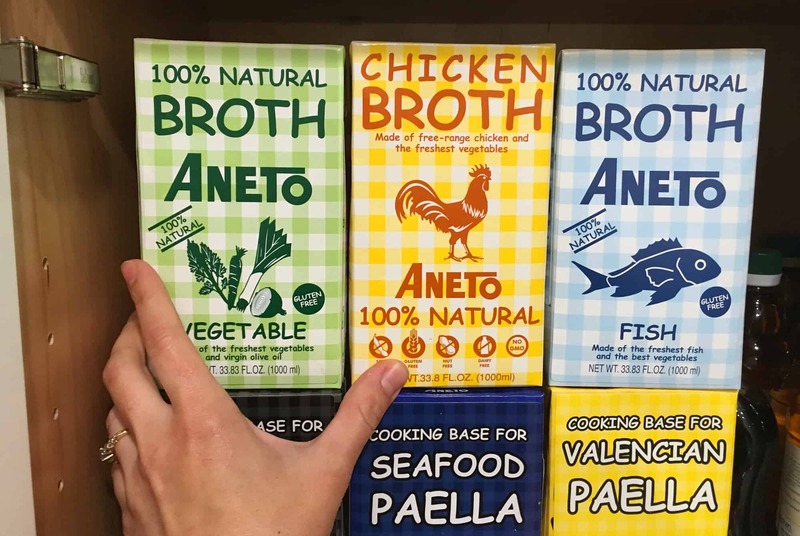 Based in Barcelona, Spain, Aneto’s premium broths can be found in a variety of stores throughout the U.S. including Sur La Table. See the list of store locations. You can also find their products online, including on Amazon (see links below). We highly recommend Aneto’s 100% Natural Chicken Broth. If you’d like to give your wonton soup a seafood emphasis, try Aneto’s 100% Natural Fish Broth. If you’d like to go meatless, in addition to using vegetarian wontons we recommend Aneto’s 100% Natural Vegetable Broth. And if you’re on a low-sodium diet, use light tamari/soy sauce and Aneto’s Low Sodium 100% Natural Chicken Broth. 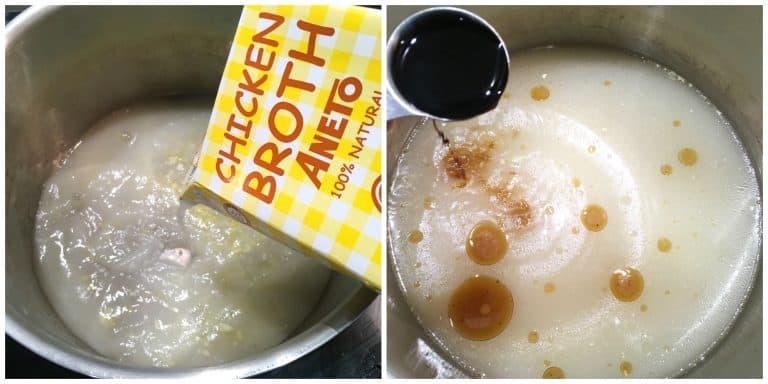 What sets Aneto so distinctly apart from other broth manufacturers is both how they make their broth and what they put in it – and don’t put in it. They make broth the way you do right at home using real, whole, fresh ingredients and simmering them low and slow for several hours to create a nutritious and flavorful broth. There are ZERO fillers, additives, powders, extracts, etc. Just real, fresh ingredients – truly 100% natural in every sense of the word. 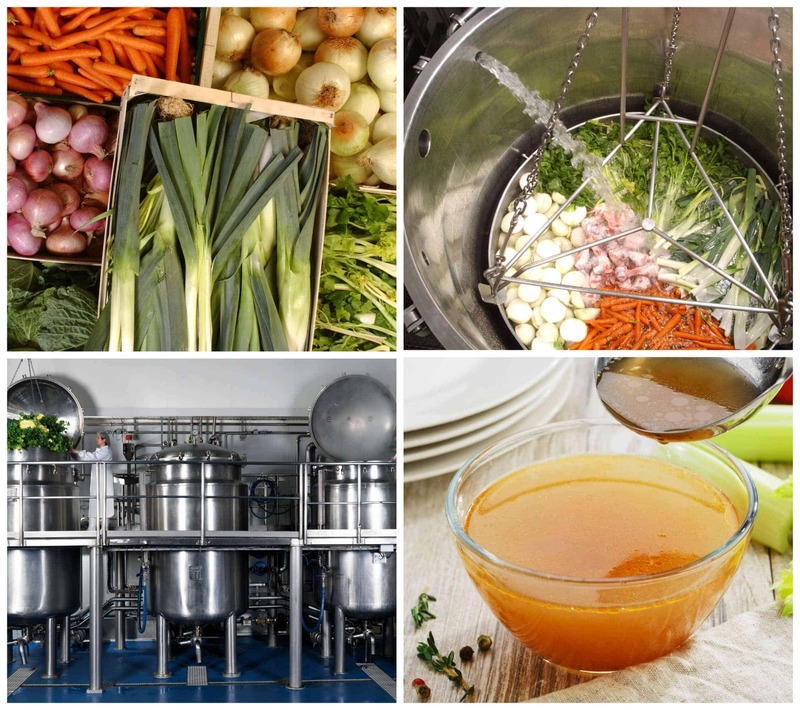 We had the privilege of touring the factory in Barcelona, Spain and saw the entire production from start to finish: Selecting, washing and cutting the vegetables, watching them get placed in enormous pots with fresh chicken, seeing the broth simmering in the pots and getting to sample some freshly finished hot chicken broth. It was such an inspiring experience and we have been dedicated Aneto fans ever since. Check out our Virtual Tour of the Aneto Broth Factory! 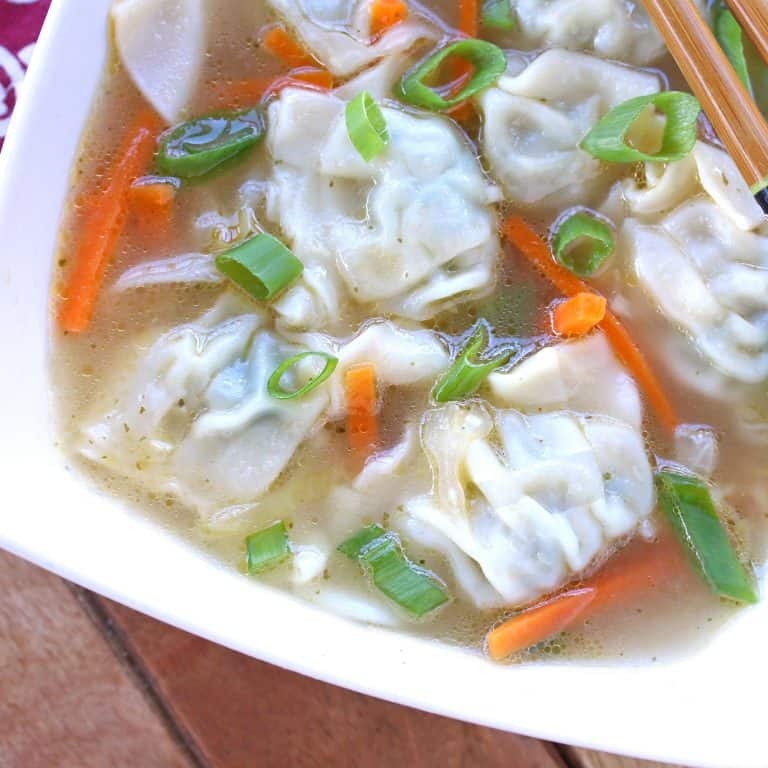 If you’re a fan of wonton soup, you’re going to LOVE this one! And if you’ve never had it before, prepare to fall in love! Ready to make the BEST wonton soup? Combine all the wonton ingredients (except for the wrappers) in a large bowl. Use a potato masher to mash the mixture, breaking down the pieces of shrimp until you get small chunks. Continue mashing until you get a smooth texture but not to the point where it’s a paste. Keep the wontons in the package so they don’t dry out or place a slightly moist towel over them. Place a wonton wrapper in the palm of your hand and spoon about 1/2 tablespoon of filling onto the center of each one. Have a bowl of water handy. Dip your other finger in the water and trace around all sides of the wrapper to moisten them. You make can fold the wontons several ways according to your personal preference: Make a simple triangle by folding one corner over the other and pinching to seal the edges; for a little fancier design pull each corner of the triangle down so they overlap and press to seal (resembling a nurse’s cap); or place the wonton in the palm of your hand with the filling in it, wet the edges and draw all the edges together and twist to seal (resembling a drawstring money bag). Repeat the process for the remaining wontons. Note: At this point the wontons can be frozen. Spread them out single layer on a non-stick cookie sheet and put them in the freezer. Once frozen you can place the wontons in a ziplock bag or airtight container and freeze for up to a couple of months. From a texture standpoint it is not recommended to freeze the wontons if you’re using previously frozen shrimp. Next let’s make the soup. 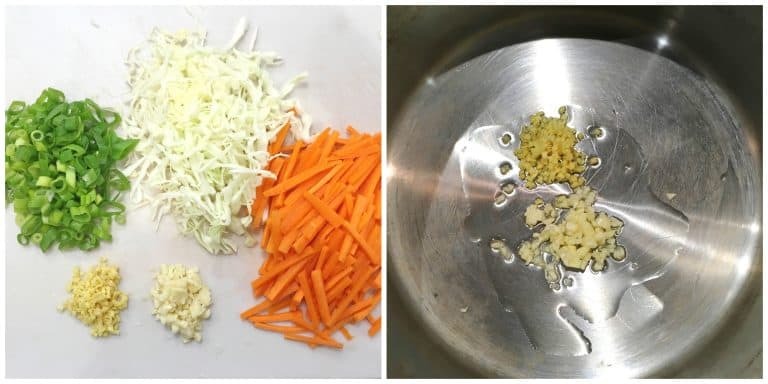 Julienne the carrots, shred the cabbage, slice the green onions and finely mince the garlic and ginger. Heat the oil in a stock pot and fry the garlic and ginger for 1-2 minutes until soft. Add the chicken broth, tamari, rice vinegar, sesame oil, and salt. Bring to a boil, cover and simmer for 10 minutes. Add the carrots and cabbage and simmer for another 5 minutes. Add the wontons, yellow miso paste and green onions and simmer for another 5 minutes. (If using frozen wontons simmer for 6-8 minutes.) Add salt to taste. Note: Some people cook the wontons separately in water, then place the cooked wontons in a bowl and ladle the broth over to serve the wonton soup. I usually just add the wontons directly to the pot of soup at the end and simmer them in the broth until done, then serve. Do whichever you prefer. Ladle the soup into bowls and serve hot. Combine all the wonton ingredients (except for the wrappers) in a large bowl. Use a potato masher to mash the mixture, breaking down the pieces of shrimp until you get small chunks. Continue mashing until you get a smooth texture but not to the point where it's a paste. Keep the wontons in the package so they don't dry out or place a slightly moist towel over them. Place a wonton wrapper in the palm of your hand and spoon about 1/2 tablespoon of filling onto the center of each one. Have a bowl of water handy. Dip your other finger in the water and trace around all sides of the wrapper to moisten them. You make can fold the wontons several ways according to your personal preference: Make a simple triangle by folding one corner over the other and pinching to seal the edges; for a little fancier design pull each corner of the triangle down so they overlap and press to seal (resembling a nurse's cap); or place the wonton in the palm of your hand with the filling in it, wet the edges and draw all the edges together and twist to seal (resembling a drawstring money bag). Repeat the process for the remaining wontons. SEE NOTE about freezing them. 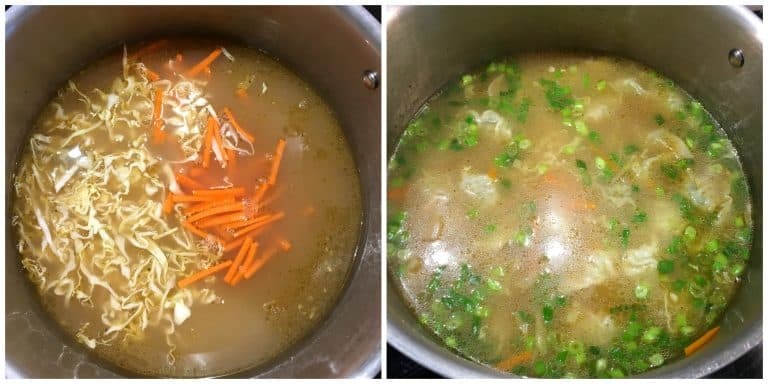 To make the soup: Heat the oil in a stock pot and fry the garlic and ginger for 1-2 minutes until soft, then add the chicken broth, tamari, rice vinegar, sesame oil, and salt. Bring to a boil, cover and simmer for 10 minutes. Add the carrots and cabbage and simmer for another 5 minutes. Add the wontons, yellow miso paste and green onions and simmer for another 5 minutes (6-8 minutes if using frozen wontons). Add salt to taste. Note: Alternatively some people cook the wontons separately in water, then place the cooked wontons in a bowl and ladle the broth over to serve the wonton soup. Do whichever you prefer. Once the wontons are assembled (before they're cooked), they can be frozen. Spread them out single layer on a non-stick cookie sheet and put them in the freezer. Once frozen you can place the wontons in a ziplock bag or airtight container and freeze for up to a couple of months. Note: From a texture standpoint it is not recommended to freeze the wontons if you're using previously frozen shrimp. Disclosure: I’ve partnered with Aneto to bring you this post. Going to make this for Sunday dinner! I love this! Can’t wait to make it. This wonton soup is so fresh and delicious! Thank you! I eat soup all year round and this is my favorite! We loved this soup! So tasty and easier than I imagined! Hi Jennifer, there are a few ways to cut back on the salt: Use low-sodium chicken broth (if you make your own you can omit it entirely), use low sodium soy sauce/tamari, and reduce the added salt both in the broth and the wontons. 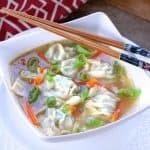 Wonton soup has always been one of my favorites and I am so excited to see that you’ve posted a recipe for it! I’m a HUGE fan of your recipes, especially your soups and have tried many of them and loved them all. So I’ve no doubt this one is going to be a winner! :) Thank you! Thanks so much, Cami, I appreciate that and I hope you enjoy the soup! I’ve got a Sur La Table near me. Going to pick up some of that Aneto broth and make this soup this weekend. I always order this out but have never made it at home. Must give it a try! One of my favorite weekly weeknight take out dinners and this recipe is just as good as the stuff I buy. Thanks! Wonderful! Easy to make, tasteful and oh so marvellous to eat! I’ve finaly found THE Wonton Soup recipe! Thank you so much for this recipe and so many others, I tried several so far and I enjoyed them all! 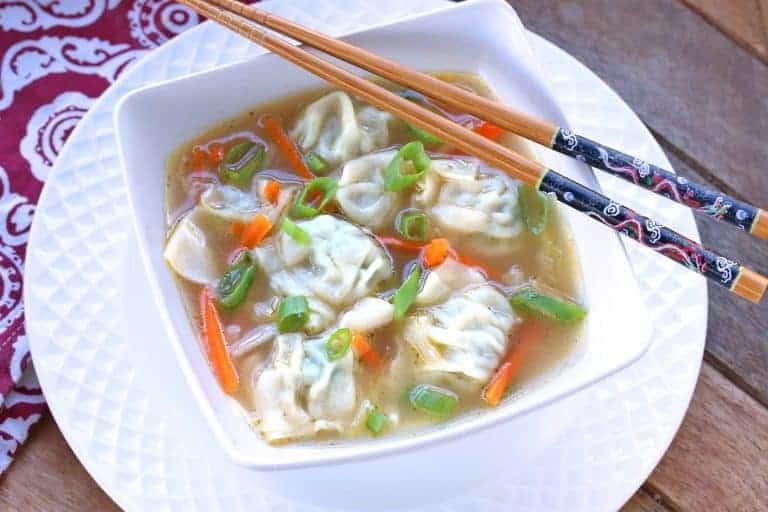 Wonton soup is something I love to try at home! I have to make yours! My family loved this soup and I loved knowing what exactly was in it! Thanks! This was EVERY bit as good as you promised! Made it exactly as written (even used the Aneto broth), didn’t change a thing, and it was PERFECTION!! Omg,this looks really delicious! Those flavors on it are amazing, need to make this soon! 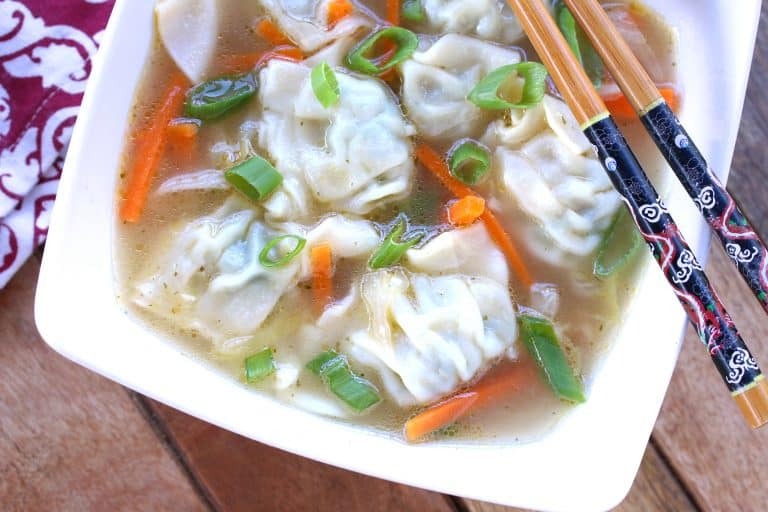 This wonton soup is soo fresh & more delicious, i will going make this for my hubby at sunday dinner. Thanks for sharing…!